Accountants are on top of numbers. It’s what they do, being that their job is to take numbers, organize them, and present them in financials. An accountant spends more time than anyone actually realizes on planning, organizing, and following their ridiculous systems. This has been partially covered in workpaper references. However since it’s such an important part of what an accountant does, it deserves it’s own post. Accountants rely on shelves and cabinets full of binders. (There are even more binders waiting in document retention.) The binders belong to different sets of indexes – such as general and workpaper. Each binder has it’s own table of contents and binder tabs. Each tab has it’s own workpaper reference system with a leadsheet and memos. The memos have procedures and so on. Accountants like to stay on top of the organization game. Since it takes a small army of people to maintain the organization system, some people spend a week doing nothing but sorting papers into binders and electronic files into folders. All hell breaks loose when a memo is out of place. It could be it’s in the wrong binder tab or the binder’s front flap. If it was completely signed off and lost, then you will see a grown person cry. In addition to sorting through papers and managing file systems, accountants invest in tools like plastic drawers, stationary trays, and day planners. This makes them appear super organized. The reality is that they now have more places to look when they lose information. Also, this is the stuff that ends up in the clearance aisle because you didn’t think anyone actually buys that stuff. Accountants take great pleasure – pleasure as in joy and self-satisfaction – when their workspace is kept organized. If there are papers all over the place, an accountant will not be able to get anything done. Working with an accountant, you should never tell them how disorganized you think they are. Instead, you could say, “How do you keep so organized? 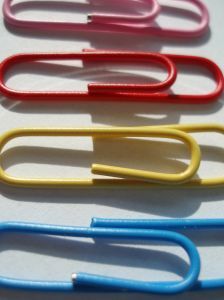 I’m always losing things.” This will make them feel secure in their job and become impressed that someone noticed all their time spent arranging paperclips and printing binder tabs. Oh, the organization only begins with the work stuff…for many of us it consumes our entire life. Like our homes and our personal lives, for those of us that manage to maintain them! Accountants are also often very organized and particular about systems that the average layperson would not necessarily associate with the profession (e.g., grammar). English grammar is an especially good example of this phenomenon, because it is a system of complicated, often self-contradictory and sometimes esoteric rules. For example, did you know that the possessive form of “it” should not include an apostrophe? “It’s” is reserved solely for the contraction of “it is”. Accountants often feel compelled to quantify and document any mistakes they notice in another’s work, whether directly related to accounting or not. Therefore, I feel it is my duty to point out that there are three occurrences of “it’s” used incorrectly in the preceding post. on 28 Apr 2009 at 10:17 pm6 Matt W.
By far the best post I have read on this site. Not only is it true but I noticed and was annoyed by the very same thing! I thought I was the exception with regard to my keen attention to spelling and grammar (not so much at the moment since it is 11:09 and I am still in the office studying for FAR). I actually once broke it off with a girl for her blatant misuse of the words there, their, and they’re over AIM. How about a test? Do ketchup packets make anyone else nervous? Going to post any more within the next month?!? The use of texting shortcuts drives me crazy. I hate receiving messages with them and I hate even worse having to send them. “U” for you, “h8” for hate, “r” for are, etc. Is it really that much more difficult to type two or three more letters? Out of sheer stubbornness, I will sometimes go five or more minutes out of my way to type a grammatically correct text message– on a standard alphanumeric phone with no qwerty and no predictive text. Ketchup packets-no…Wendy’s Frosty-yes, let one melt and you will never eat another as long as you live. I truly understand your pain! One of my biggest pet peeves is in reference to the directional use of up/down. For example: I am going up to San Diego to Visit my friend (when in reality one is going from Northern California to San Diego and it should be “going down to San Diego). Irritates me to no end!! !